France has quite a rich history in chess as François-André Danican Philidor was one of the first players of note during the 16th century. Since then France has continued to produce a number of strong players. Currently, Joel Lautier and Etienne Bacrot grace the top boards with rising 14-year old star Maxime Vachier-Legrave having emerged asFrance's new phenom. There are other players of note who may not have received attention in years gone by. 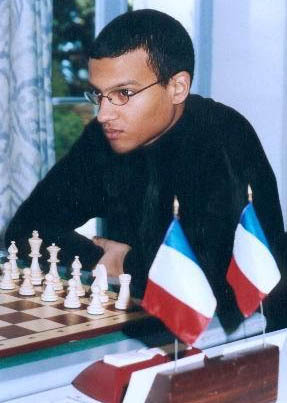 One such player is 28-year old International Master Benjamin Bujisho of France. A lengthy online interview appeared in echecsvariables.com by Yvan Poirrier. A native of Le Mans, Paris, Bujisho is also known for being the younger brother of former French Women's Champion, Raphaelle Delahaye. Delahaye (then Raphaelle Bujisho) won French Girls' Championship in 1989 and captured the championship in 1995 at age 19. Bujisho, who speaks fondly of his older sister stated, "Unfortunately my sister has stopped playing because her life as the mother of her family requires a lot time!" Benjamin has done a good job in carrying on the family tradition. It is unclear from the interview what impact his sister had on his play, but Benjamin apparently learned chess from his father at age five and began playing in tournaments at the age of eight. He participated in the French Junior Championships from 1986-1998 and in 1988 placed 2nd behind Igor Nataf (who is now a GM). He placed 3rd both in 1989 and 1990. In 1995, he won the French Open "B" held in Nantes with a sizzling 9½-1½ at age 15! At 16½, he got his first FIDE rating of 2295 and hit a spurt in 2000 and another in 2002. He earned about 40 ELO points in both years and would peak at 2411. Currently, he is a professional trainer with a Certificate of Trainer of FFE (1st level). Initially, he did not have the title of IM at the time of his certification, but was 2344 FIDE and had earned one IM norm in July 2000. It was in 2002 that he earned his IM title by earning norms in rapid succession in February and May of 2002. Bujisho does not have a chess idol, but tends to favor the style of Veselin Topalov, the world's #1 player. It is no surprise that he plays 1.e4, but he claims to a positional player. One of his influences were the books by Iosif Dorfman, La méthode aux échecs and Le moment critique. He read those books in 2000 and perhaps his improvement was a direct result from lessons learned. Bujisho spoke of the difficulties and challenges in vying for the Grandmaster's title. "It would require financial assistance to get there,'" he says. He stated that parents, in general, prefer their children to take up studies, but it is very difficult to do both at a high level. Currently, Bujisho continues as a trainer at local colleges and at Niçose Chess Club in Nice where he also plays for the club team.